The Whip-Lash has a lot more going for it than you would think! The curvier outline and refined template offers better performance all round, and its moderate entry rocker helps to get this board up to speed quicker through turns, thus generating instant speed, and allowing for quicker rail to rail transitions when doing tighter arcs. The volume is distributed evenly throughout, and with the option of soft forgiving rails, up in the nose area, this helps to prevent catching, which in turn helps to get the board up onto its edge quicker, keeping the board, free, loose and responsive in most surf conditions. This is very noticeable at first when riding this model. 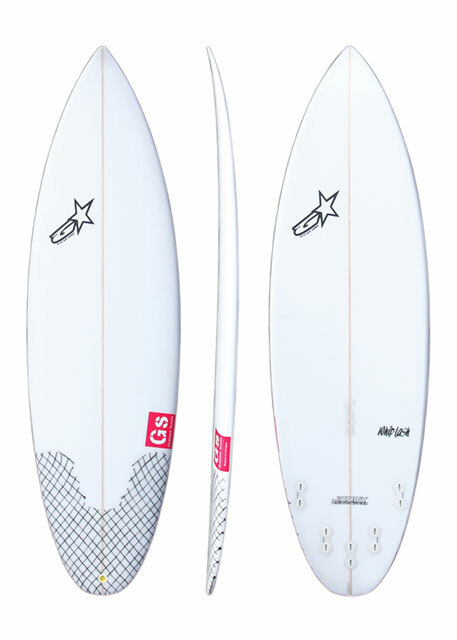 The extra tail surface area is key, giving you better options for most surf conditions, and with the combined deep concave, enhanced for maintaining speed, will carry you through the flats, making this board very responsive. The pulled-in and edgy pod will allow for tight radius and critical turns, and it is relatively easy to surf. It should be ridden between 2 to 3 inches shorter than your regular board! As we have no “hip” or “bump” in the tail area. The clean tail outline options are mostly requested as a round pin, but we are finding that squashes are in demand, so we cluster the fins about 1/8″ back to give better hold in punchy conditions. However, I have had requests for swallowtails that measure out at 5 1/2″ across, and proven to give you a bit more looseness in the smaller conditions. Our standard 5-fin setup works best and gives you more options to use in different variations, as in Quads, Thrusters or even as a 5-fin setup! The choice is yours!